The European REACH regulation, which aims to ensure a high level of protection for human health and the environment, imposes strict rules on the use of chemical substances. In order to protect employees in its production sites in Champagné and Marolles en Brie, SOURIAU is adapting its electroplating processes in response to these new regulatory constraints and at the request of its customers. 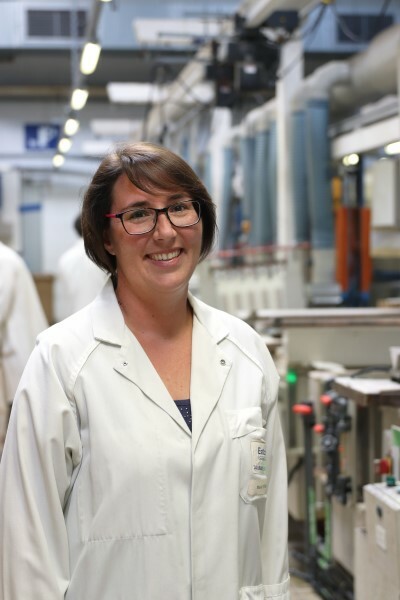 MARIE LE SCAON, Technical Manager of Surface Treatment at the Champagné, factory, provides an update on the solutions envisioned by the company as substitutes for hexavalent chromium. Why is REACH such an important topic for SOURIAU? MLS: Since September 2017, European regulations prohibit the use of hexavalent chromium in our electroplating processes for the treatment of connectors in aluminium alloy and in composite. We have obtained a delay from the European chemicals agency to allow us to continue to use this substance but our teams have been working on alternative solutions for a long time. It's a major factor for preserving the connector manufacturing activity at the Champagné plant. How is this search for alternatives organized? MLS: First of all, our industrialization department works in the preparation phase with our suppliers of chemical products to benefit from their experience in other industrial domains, for example in the car manufacturing or plastics industries. Then we adjust their product ranges to our needs in terms of continuity, handling, appearance and resistance to salt spray. Then later, when the solution has reached a certain degree of maturity in terms of the process, we work with all the production services to validate and qualify the solution. Why is it so difficult to avoid using cadmium? MLS: Our connectors are intended to be used in harsh environments. Because of this, the outer protection is of capital importance. Cadmium and zinc-nickel meet the required criteria in terms of finish and reliability for components which may be used for several decades in all types of operating conditions: heat, cold, salinity, corrosion, etc. The other advantage of cadmium is that it is cheap and readily available... so doing without it or replacing it is not quite so simple! Does the same apply to hexavalent chromium? MLS: The hexavalent chromium passivation process is the only feasible solution if one wants to have cadmium plating with an olive green color. What's more, this treatment gives the connector housings self-healing properties which are very useful for long-term reliability. Another important aspect in terms of production is the treatment speed, which takes only 30 to 45 minutes whereas other plants take up to 1-1/2 hours and even more! Up until now, the universal applicability of hexavalent chromium and cadmium has made them an indispensable pairing. As of today, what is the status of the replacement solutions? MLS: For composite connectors, we have developed a range of treatments for different plastic materials which are hexavalent chrome-free and yield a finished surface with identical performance. It's an important result, because it allowed us to reduce our consumption of hexavalent chromium by 50% this year. For aluminium connectors, we are actively working on a passivation solution using trivalent chromium which is authorized by REACH. However this perfectly workable solution does not currently replace hexavalent chromium in all cases. Compromises are therefore necessary. MLS: It's true that we are confronted with constraints that are imposed on us by international standards like MIL, EN, QPL, etc. which we have to comply with in the aeronautic and space sectors but also in rail, nuclear, wind turbines, and military hardware in general. Let's not forget that the major industrial markets which consume large volumes of chemical products and which are also impacted by REACH have the same deadlines as we have! Yes, the REACH regulation generates problems for us, but all the same it's a real accelerator for innovation which overcomes the obstacles. Could you describe the context in which you work? MLS: Certified ISO 14001 since 2001, SOURIAU is a global supplier of connectors for harsh environments. We manufacture 13 million connectors annually. The electroplating workshop, which I'm in charge of on the technical side, is equipped with a ventilation system which changes the air out every eight minutes. The air goes through cleaning towers which treat all the effluents and the residual wastes are treated by a specialized company. We use 8 tons of hexavalent chromium annually. With REACH, this consumption has already been reduced by 50% as a direct result of the changes to the industrial process. MLS: As soon as the REACH regulation was put in place, the management of SOURIAU decided to do everything possible to make compliance with this new regulation a success. Today, REACH only applies to Europe, but in the mid-term or long term it affects all the major industrial countries. And the large European customers consider REACH compliance as a key factor in selecting their suppliers. What's more SOURIAU is ahead of its competitors: the will to succeed, the investments and the cohesive teamwork surrounding this project have already produced tangible results.